The 3DAnalyst library contains objects for working with three-dimensional (3D) scenes in a similar way that the Carto library contains objects for working with two-dimensional (2D) maps. The Scene object is one of the main objects of the library; it is the container for data similar to the Map object. The Camera object specifies how the scene is viewed regarding the positioning of the features relative to the observer. A scene consists of one or more layers that specify the data in the scene and how the data is drawn. The 3DAnalyst library provides the base for customization of the scene, although it also addresses some aspects of globe (see the GlobeCore library for more details). A SceneControl and a set of scene commands exist in the Controls library together with a ToolbarControl, TOCControl, and helper objects for creating your own custom commands. In addition to these functions, the SceneGraph coclass also helps with the 3D rendering by implementing the IDisplay3D interface, which converts the layer data and symbology into drawing calls. Therefore, the SceneGraph coclass plays a pivotal role in visualization in 3D Analyst. //To get a camera of the active viewer. 'To get a camera of the active viewer. //Get or set the feature layer 3D properties. 'Get or set the feature layer 3D properties. Animations in scene can be created using ArcObjects in the Animation library. The ArcObjects in the 3DAnalyst library can still be used to export animations to AVI or QuickTime formats, but it is recommended that you use the objects in the Animation library instead. For more information, see the Animations section in this topic. 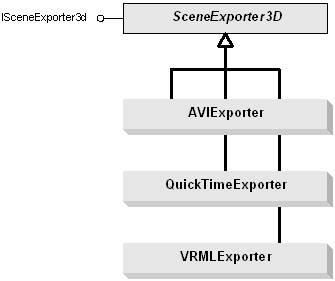 The following code example shows the minimum way to export the scene to a VRML model. The assumption is that you have data already added to the scene. The script exports a VRML model using the default settings. To customize your settings, cast to ISceneVideoExporter and IVRMLExporter for VRMLExporter. The following code example shows how to get the Camera object of the active scene viewer using both the ISceneViewer and I3DViewer interfaces. The usage for both interfaces is similar. The camera object returned is the same using either interface because both pointers (pSV and p3DV) are pointing to the same viewer (the active viewer) and there is only one camera object for each viewer. 3D symbols provide enhanced capabilities for feature representation in 3D viewing environments. There are several types of 3D symbols for points, polylines, and polygons. They offer simple geometry primitives - for example, cubes, spheres, and tubes. They can also use complex and textured geometry, such as models of buildings or planes. This variety of capabilities is useful for the more abstract demands of scientific visualization as well as photo-realism for simulation. Supported 3D marker symbols are SimpleMarker3DSymbol, Marker3DSymbol, and CharacterMarker3DSymbol. Supported 3D line symbols are SimpleLine3DSymbol and TextureLineSymbol. TextureFillSymbol is used for polygons. The following illustration provides an overview of these symbols. 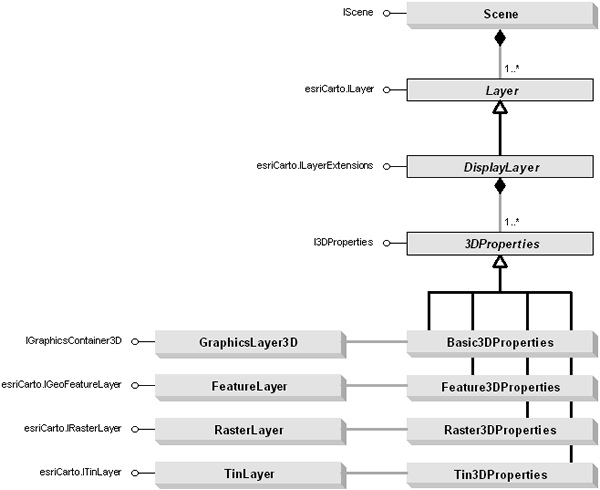 For a detailed view of these 3D symbol components, see the 3DAnalyst Object Model diagram. TextureLineSymbol and TextureFillSymbol have one associated GeometryMaterial; it can be read and set (by reference) using the symbol's Texture property. A 3D marker symbol can have multiple instances of GeometryMaterial. Each is maintained by the GeometryMaterialList coclass that is associated with a MultiPatch geometry. This, in turn, can be instantiated by using the GeneralMultiPatchCreator coclass or imported using the Import3DFile coclass. In fact, all symbol templates stored in the ESRI-provided 3D Marker Symbol styles are created by using either the GeneralMultiPatchCreator coclass or the Import3DFile coclass. 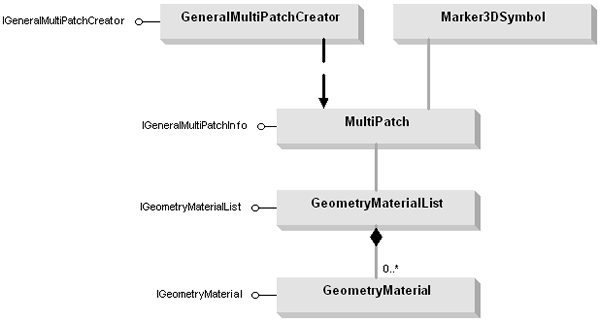 The end result of using these two coclasses is a multipatch geometry that, when used with GeometryMaterial, can have color, texture (image), or both. The following code example shows how to get the GeometryMaterial count for the first feature of the first layer (assuming it is a feature layer) in the scene. It shows both ways to query the property when the layer consists of a textured multipatch feature class (query multipatch geometry property) or a point feature layer symbolized using a 3D marker symbol (query 3D marker symbol property). Animations allow you to create dynamic visual effects by storing actions (behavior of objects), which can be replayed later. In scene, you can create animations to visualize changes in the view, scene properties, and layer properties as well as temporal changes in the data. Animations can be created using the Animation library. ArcObjects from the 3DAnalyst library that were used to create animations at ArcGIS 9 and 9.1 can still be used, and existing projects using these objects should still compile. If you have any compilation of projects issues, reference the Animation library. It is recommended that you use the objects in the Animation library for new projects. As described in the Animation library overview, an animation consists of one or more animation tracks (AGAnimationTracks), which control changes of the properties of an object, such as the scene's background color, the visibility of a layer, or a camera location. Each track is associated to a certain AGAnimationType. AGAnimationType properties - AnimationTypeCamera, AnimationTypeLayer, AnimationTypeScene, and AnimationTypeTimeLayer - are available out of the box in scene. You can optionally implement custom types.